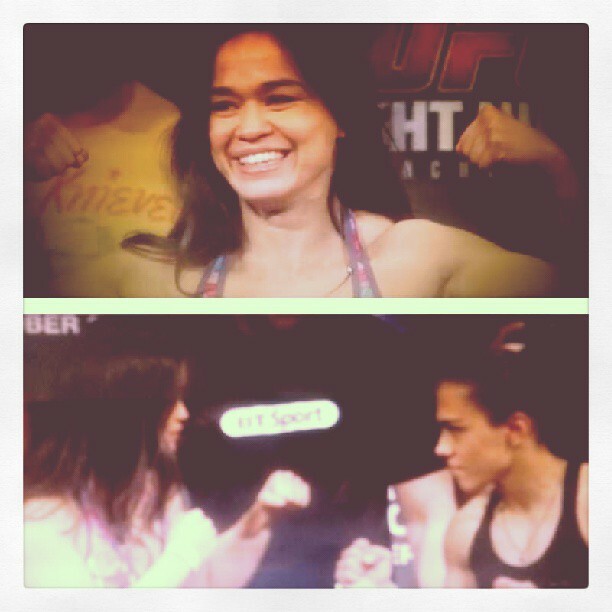 Before making history as the UFC’s first ever female fight to happen in Europe and UK. I caught up with UK MMA pioneer and Cambridge graduate Dr Rosi Sexton ahead of UFC® MANCHESTER back in September 2013. EB. You’re a pioneer for women’s UKMMA, starting your professional career back in 2002.Was it ever in your own thoughts that one day women would be in the UFC and you would be here in the UFC representing the UK now? RS. I always thought it would happen one day. I think early on I hoped it would happen in time for me, but as the time went on I kind of gave up hope it was going to happen to me a few years ago as it wasn’t looking very likely, then the first women’s fight came around very quick, it happened very fast with the Ronda Rousey and Liz Carmouche fight and a lot of opportunities opened up and took me by surprise it wasn’t something I anticipated, but embraced it. EB. Having said that if the UFC were an option back in your earlier career, would you have also taken the opportunity back then? RS. I’m in a better position now and the division is better on a whole as it’s a lot more competitive, to be honest it happened just at the right time. EB. How close were you to throwing in the towel and hanging up this side of your career before being signed to UFC? RS. You have to remember no Professional athlete goes on forever and I didn’t actually say I had retired from the sport; I had reached a stage where I had done most of what I wanted too, and also it was getting difficult to justify the financial terms that go hand in hand with the sport, along with being a single parent to my son, I guess you can say I was just waiting for a bigger opportunity whatever that may have been, and for me, thankfully it was the UFC. EB. Can you talk me through your feelings, emotions and pressures of being the UK’s sole Female representative in the UFC; fighting in the UK on October 26th in Manchester which is also the UFC’s first ever female fight to happen in Europe and UK in your home town? RS. Very excited as it is huge. It will be the first women’s UFC fight in Europe, and I will be fighting in my home town for the first time in my whole fighting career. There will be pressure, but I feel it will be a kind of good pressure and I will rise to the occasion. EB. How easy has it been to get back into training on the back of your loss to Alexis Davis? Can you talk me through the fight and your own opinion of your performance? RS. It was a good fight, very competitive, good performance. I could have done better and some things cost me the fight. A lot of people were expecting me to get beaten before I went into the fight, no one was talking about me before the fight, they were all talking about Ronda Rousey and how Alexis Davies would walk right through me, but she didn’t. I think she did win it, but it was really close, I was pleased with what I did, not satisfied, pleased. If I could do again I would. EB. It is no secret this is not your usual fighting weight division, but when an opportunity such as the UFC comes knocking on your door (when you have been a UK MMA pioneer in the sport for just over 10 years, you’re not going to turn it down) – How are you finding the higher weight division? RS. Good question, 125lb is my best weight class, 135lb I would say I am a bit on the small side but I will give any 135lber a good run for their money in this division , win or lose they will know they have been in a fight when faced against me. Jessica Andrade is a good fight and we have similar styles, I belong in this weight class, I am strong at this weight, I can hang with the other girls; other girls are bigger, that maybe a factor, it depends on the individual, I have upped my game slightly as I cannot rely solely to power through in this weight division. There are some good fun fights for me in this division, having just recently fought and in my own opinion held my own against the worlds ranked #4 or #5, I belong in this weight class and of course on the flip side I am enjoying being able to eat more. (Ben & Jerry’s Ice Cream). EB. How is your training camp going for this fight? Are you implementing anything new into your training schedule or is it a case of drilling everything you know? RS. Going real well, had a good week, feeling sharp, have great training partners in flyweights, bantamweights at Next Generation. I’m currently training with a World class Olympic Judo athlete Sophie Cox, who is very solid and has dangerous throws. I am very fortunate in that I also have Laura Howarth helping me out, who has a great striking background. Come October 26th you will see a better version of me. EB. Now that the sport is evolving and there are more females, how has this helped you and is helping you in your current training as I’ve seen you’ve got the likes of Laura Howarth and Sophie Cox training with you? It must be nice to mix things up and have females involved in a training camp? RS. It is important to have men, having always trained a lot with men, women are also important, they are different in a whole other way, which is also a whole other question as they really go at you, it is great to have a mix, you can judge where you are at with the females as in size and strength; both females are great to work with as previously mentioned, Sophie is a World class Olympian and Laura comes from a great striking background with a great future ahead of her. EB. What are your thoughts on the current season of TUF18 with it being a mixed household? RS. It’s interesting, I’m not up to date as I’ve been training but what I’ve heard is that it is going well, people are talking about it, the women are great and are serious athletes. The women’s fights are great and this is what needs to be showcased for people who are not familiar with women in the sport. EB. What can the fans expect to see come October 26th at The Phones 4U Arena in Manchester? RS. Exciting, fast paced fight, with fast paced rounds, combining powerful striking, good grappling; from what I see Jessica also has a strong background in Judo with some Jiu Jitsu skills; she is a dangerous fighter and if you’re not ready for her intensity she can catch you out, but I am ready. EB. How did you get into MMA? I heard that you watched a TV documentary and was hooked from there? RS. (Laughs) I was watching a TV documentary back in 1999 which had UK Pioneer Leigh Remedios in and now recently retired ex – UFC veteran Ian Freeman, I thought I wanted to do that, little did I know where it would lead to and that I would end up being the first UK female fighter in the UFC. EB. Besides the fact that you are on the Manchester card, which fights in particular have caught your eye and you are looking forward to watching? RS. Michael Bisping Vs Mark Munoz, Ross Pearson Vs Melvin Guillard and of course my fellow midget Phil Harris, all the fights have great UK talent on them. RS. My team coaches Paul Williams, Danny Rimmer, Steve Campbell, Mike Leng my Nutrition coach, PhD Nutrition, Funky Gums, Ainsley Fry, Global Therapy for keeping me in one piece, Strength and Performance gym, Rev Gear and Next Generation Gym. Rosi Sexton takes on Jessica Andrade at The Phones 4U Arena in Manchester on 26th October. Tickets for UFC® MANCHESTER 2013: BISPING vs. MUNOZ are available from www.ticketmaster.co.uk and www.phones4uarena.co.uk. This interview went to print before it was announced Michael Bisping had to withdraw from the event, therefore Lyoto Machida replaced him to face Mark Munoz.